Guild Care is proposing to join forces with Worthing Littlehampton District Scope. 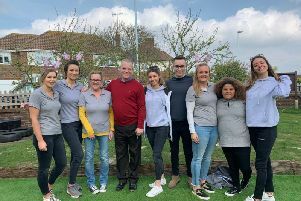 The announcement was made at the Worthing-based charity’s annual meeting and if the proposals are accepted by members, Worthing Scope will become a subsidiary company of Guild Care. employs around 40 people and supports hundreds of people in the area. Worthing Scope was established in the 1960s to support children and adults with a disability, especially with cerebral palsy. Guild Care has provided a full management contract supporting its services since March. Jacquie Pinney, Worthing Scope chairman, said: “The trustees of our charity had been mindful of the need to provide good management support within the charity and did not feel our current structure and financial resources allowed us to do this. “We considered other partners such as national Scope but wanted to ensure our much-needed charity is aligned with another organisation that has similar ethos, vision and values. Guild Care, one of the largest charities based in Worthing, is future proofing itself to ensure it can continue to provide vital lifeline services, according to a report given at the annual meeting, attended by more than 60 people. During the last financial year, Guild Care supported 3,000 vulnerable older people and children with disabilities. The charity, which was established in 1933, also contributed £2.4million to a range of community and accommodation-based services and was helped by more than 300 volunteers. Allen Reid, chairman of trustees, said: “Our community services offer enormous public benefit for each pound of investment, and this is something that we need to ensure continues for the long-term. “Our future aim is to improve our financial management to ensure that the organisation can become self-sufficient at core service level, allowing us to move forward with confidence. Suzanne said the charity was now entering a new five-year strategic plan phase, with Building our Community as the focus. She said: “The approach shows a renewed emphasis on our need to invest in our workforce with wider learning and development opportunities and better engagement with all our stakeholders. “We continue to work towards making sure Guild Care is seen as an employer of choice within the area supporting all staff to reach their full potential.